Fast Lane Biker Magazine received the following information on 12/5/2018 from Jam-On Productions regarding the 2019 Timonium Show. We are printing the letter as received to honor our commitment to keep our motorcycle community informed and educated. For questions or comments, please visit www.internationalmotorcycleshow.com. Many have received notice of this shows cancellation, and it was cancelled by the previous promoter due to illness. We wish him a speedy recovery while, at the same time, continue supporting him in his time of illness by attending his RV shows scheduled the following two weekends AFTER the motorcycle show. Jam-On received a phone call informing us that the Timonium Fairgrounds was in negotiations to rent the facility to a boat show – meaning no more motorcycle show. We were busy with our show in Atlantic City and really could not handle this responsibility alone. But did not want to let something we started in 1983 vanish forever. Many local dealerships who have love and passion for the motorcycle community stepped up and offered their expertise in keeping the show alive. When you see these dealers at the show remember to thank them, because without their help it would have become a boat show!!! We would also like to profoundly thank the superior management of the Maryland State Fairgrounds (Timonium). We hope this helps clear things up. The show would not be a proper show unless we include a SWAPMEET. Afterall, Jam-On Productions is the producer of the World’s Largest Motorcycle Swapmeet (SHAMELESS PLUG: Celebrating its 41st anniversary during Daytona Beach Bike Week). Several Antique Motorcycle Clubs that have missed previous years agreed to return to the 2019 show adding 100s of vintage bikes. Race teams will be available for ops, autographs and to talk bikes. To date, this includes: Drag, Enduro, Trials, Hooligan, Flat Track, Ice, and Cannonball (the list expands daily – if you have something you believe the motorcycle community deserves to see please get in touch). All of our events are family friendly and include clowns, face painters, and kid amusements to keep your children entertained for hours. THESE ARE THE MOTORCYCLISTS OF THE FUTURE. $300 cash door prize will be awarded on Saturday at 7 pm and on Sunday at 5 pm. WE DRAW UNTIL SOMEONE WALKS WITH THE MONEY! 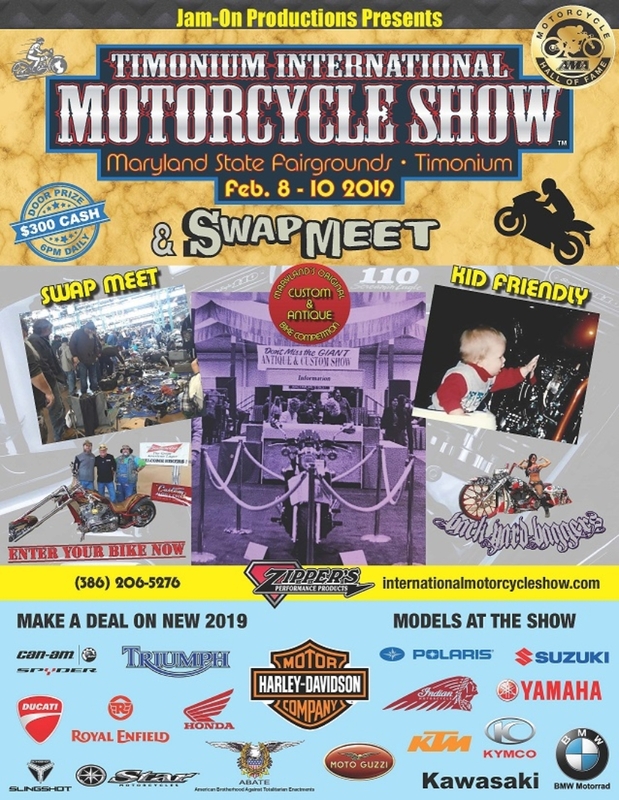 Abate of Maryland & AMA is welcome to a free booth as Jam-On Production’s CEO is a Founding Member of Abate of Maryland as well as a lifetime member of AMA and of the AMA Hall of Fame. With over 40 years in strictly motorcycle events by a true motorcyclist, and being the FIRST promoter to ever present New, Custom, & Vintage Motorcycles of every brand in the same building with carpet and drapes, this year’s show could not be in better hands. WE WELCOME ANY & ALL MOTORCYCLISTS. In the best interest of the continuance of this show, we respectfully request that if you have a bad attitude and cannot get along with others, please don’t ruin the fun for everyone and just stay home. Active military and 1st Responders: FREE FRIDAY 4-5pm w/I.D. For up-to-date information or to contact the show promoter visit www.internationalmotorcycleshow.com.